Apricots contain no fat and are a powerhouse of nutrients, vitamins and minerals which are highly important for overall body health. The fruit is currently the focus of ongoing medical research studies for scientists who seek to uncover all. The apricot is a member of the species Prunus, and classified in the plum family with the subgenus Prunus. Apricots were first cultivated in India around 3,000 B.C., brought from the Silk Road. In Armenia, apricots have been cultivated for so long it is believed this is where the fruit originates. The fruit has been cultivated in Persia since ancient times and dried apricots were used as an important commodity on trade routes. Apricots were brought to the New World by English settlers who brought the fruit to the colonies. Where are Apricots Grown and How to Grow Them? Apricots are cultivated all over the world with Turkey leading production, followed closely by Iran. In Armenia, apricots are grown in the Ararat Valley. Other countries that lead world production of the fruit include; Italy, Syria, Morocco, Pakistan, Japan, Spain, Algeria, Greece and France. The apricot is native to a continental climate region which experiences a period of cold winter weather, though the tree can also grow in Mediterranean climates as well. The plant prefers a sunny location, well drained soil with a pH range of 6.0-7.0 and a mixture of 10-10-10 fertilizer added every second year for maximum yield. Raw apricots contain many vitamins, minerals and nutrients which are beneficial for the body, such as; potassium, phosphorus, calcium, riboflavin, iron, vitamin A, magnesium, zinc, beta carotene and vitamin C. Other trace nutrients found in the fruit include selenium, manganese, thiamin, copper, folate, vitamin B6, pantothenic acid and choline. The best way to preserve the vital mineral content found in apricots is to serve the fruit fresh and raw. Other healthy ways to prepare apricots include dicing the fruit and adding to salads, roasted with a meat dish or stewed and made into jellies, jams or preserves with no refined sugar added. There are heart and eye protective benefits found in apricots, as well as fiber which are proven disease fighters. Apricots have a high beta-carotene content which is important for heart-health and lowers levels of LDL cholesterol in the blood. The vitamin A content of the fruit is vital for the health of eyes and promotes good vision. Vitamin A is a powerful antioxidant which prevents free radical damage to the tissue and cells of the body. In a medical research study published in the Archives of Ophthalmology, subjects who consumed high amounts of fruits, vegetables and antioxidants such as vitamin A, E and C, as well as beta carotenoids experienced a reduced risk of developing cataracts and age-related macular degeneration. Apricots are high in vitamins and minerals which have been directly attributed to good vision and ophthalmologic health. 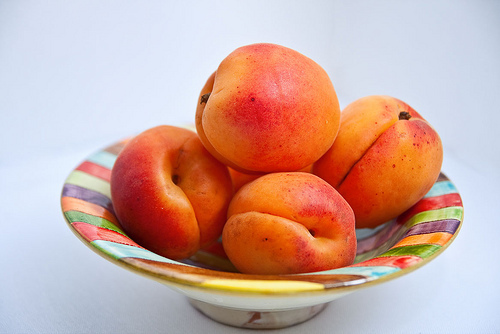 Apricots also contain lycopene which can help prevent certain types of cancer and provides cardiovascular protection. The lycopene found in apricots can reduce the risk of certain forms of cancer and preliminary research studies have shown the vital phytochemical can reduce the incidence of prostate cancer. Other health benefits of apricots include the ability to treat skin rashes, anemia, fever, ear aches, constipation and indigestion. Apricots are high in dietary fiber which promotes healthy bowel movements and prevents chronic constipation due to having laxative qualities. The fruit also aids in the digestion process and can be beneficial for preventing ulcers. Apricots contain no fat and are a powerhouse of nutrients, vitamins and minerals which are highly important for overall body health. The fruit is currently the focus of ongoing medical research studies for scientists who seek to uncover all of the various benefits apricots contain.